Airports can be hectic, and just about every traveler knows the stress of visiting an airport they have never been to before and trying to quickly navigate the maze of terminals to find their gate so that they can board a plane on time. 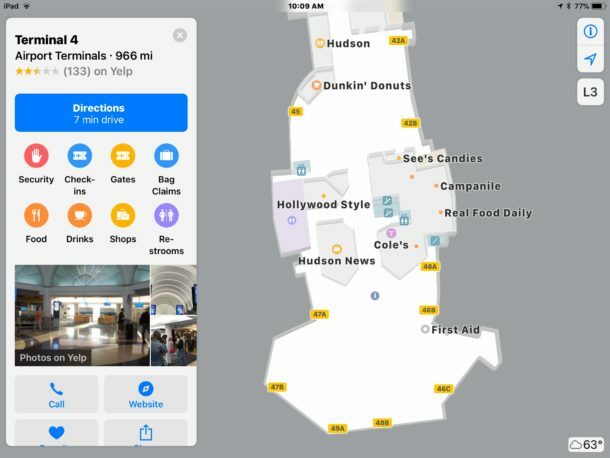 A great trick that can ease the stress of travel and help you plan your travels better is to use Apple Maps on an iPhone, iPad, or Mac, to virtually navigate within an airport beforehand. 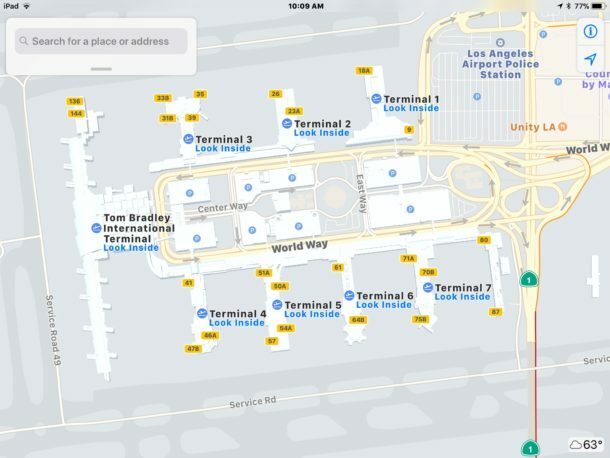 With Apple Maps airport exploration mode, you can explore inside airports to find terminals, boarding gates, baggage claims, check-in counters, security checkpoints, bathrooms and toilets, restaurants, shops, and more. This makes travel planning a bit easier and takes some of the stress out, particularly if you’re visiting a huge airport, or one you’re just unfamiliar with. All you need is an iPhone or iPad to get started. The rest is super easy. In the example screenshots here, we’re using an iPad to browse Los Angeles International Airport (LAX), which is a large, busy, and particularly sprawling and complex airport to navigate around with its myriad shuttles, many terminals, parking garages, as well as many food and shopping options. You can use this feature anytime from an iPhone or iPad as long as you have internet access on the device, but it’s probably best to browse around an airport before you’re actually in it, or when you’re in it. Of course you could also use in-flight wi-fi service to browse through a destination airport before you land, which would certainly make the process of landing a bit easier too. If you already know where to go before you land, you’ll be navigating the airport like a seasoned traveler! If you’re traveling with a companion but on different flights, or you’re looking to meet-up with someone in an airport, a great way to use this feature is to use this in combination with either Mark & Share Location in Maps for iOS or “Share Current Location” in Messages on iPhone, to share where you are, or where you want to meet up, with your travel partner, so that you can meet up with each other in the airport for a quick bite to eat, or to pair up and find your baggage together. That’s particularly great if you’re flying to the same destination as someone else but you’re on different flights. Oh and as a bonus tip, don’t forget that you can also see the weather reports of locations in Apple Maps too (it’s in the corner of the Maps screen), so if you’re not quite sure what the weather will be upon arrival or departure, you can check that as well. 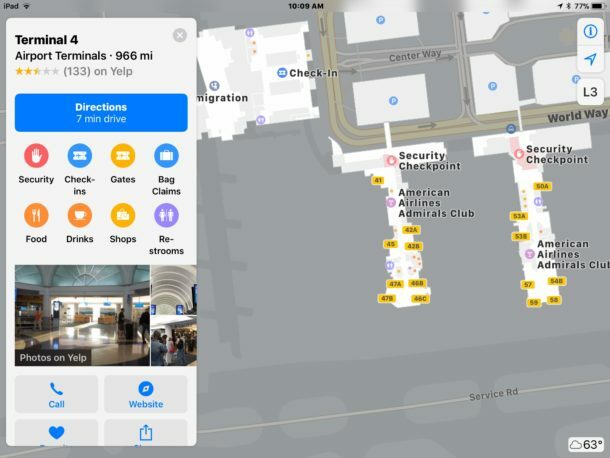 Do note that not all airports are supported by this Apple Maps feature, yet anyway, but most major international airport hubs, busy US airports, and international airports are supported and can be browsed through this way. Considering that it’s usually the biggest and most busy airports that are the most complex, this makes some degree of sense, but don’t necessarily expect a tiny airport in a rural location to be included in the Look Inside feature of Apple Maps, so if you’re flying into some tiny remote destination you’ll have to just figure that one out on your own. This is clearly useful but not enough airports are supported by Apple Maps. I don’t know if Google Maps supports this too but if it did I would use it there. Google Maps does support indoor maps and it does so for a lot more places in many more countries than Apple Maps does. 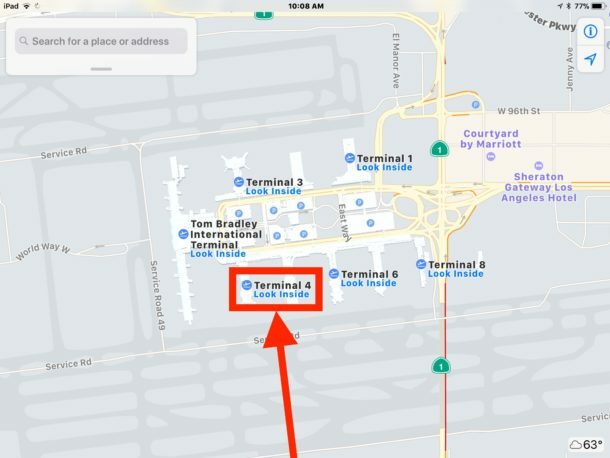 As far as airports, Apple Maps only features indoor maps for airports in the US, while Google Maps also includes airports in other countries such as Canada, Mexico and several airports in Europe. It works for Heathrow for me, you must be doing something wrong. It does, maybe you didn’t zoom in close enough or on the right spot. It also works for London’s other airpot, Gatwick. That’s weird. They do have indoor maps for LAX and the feature is supposed to be available on all devices running iOS 11 or later, no restrictions there. Worked ok for me for LHR. Seemed to want London Heathrow first time but then worked fine for LHR. Okay for London Gatwick as well LGW. Nice feature. Yeah, you neglected to state that only a few airports offer this feature in maps, how convenient of you to leave that out. !!! You’re complaining about Apple not supporting additional airports! Well I tell you what that is the START of problems with this Maps Airports Exploration Mode SE Plus Edition Pro Touch Bar Deluxe RED Project Edition Pro! Here I am complaining that Belgian waffles are NOT actually made in Belgium!!! LOL!! Convenient for YOU to leave that out Saul!!! You don’t even care about the authenticity of Belgian waffles!!! You take your iPhone and you think you know about waffles, then you discover the airport isn’t even covered with waffle syrup!!! LOL!! Map my waffles! Yeah, Apple Maps support for indoor maps for places outside the US is extremely limited. Google Maps offers indoor maps for a lot more places. San Francisco International not included, Oakland International not included, Charles De Gaul International not included. They do have the indoor map for Oakland International on Apple Maps, maybe you didn’t zoom in close enough. Google Maps, on the other hand, has indoor maps for all three airports. Does NOT work for older iOS devices, does NOT work for High Sierra. Would be helpful if these articles identify which devices that they are applicable to. Also agree that MOST airports are not covered. This article is a waste of space. Well I enjoy a good airport like the rest of them, but I tell you what when I loaded up my broccoli this morning at the grocery store and I went to find the “Maps” application on my broccoli it was not supported!!! Wow, maybe you should have said that there is no broccoli support for an iPhone feature???? Like Bill I am very disappointed that I can not explore airports on my Apple II personal computer from 1986!!!! Unbelievable!!! It would be helpful if you could clarify exactly what is NOT covered so that when I try this with my pet ferret on his water feeder he will not be disappointed by Apple not supporting Maps for Ferret Cages!!! Furthermore I also tried to explore airports using my hamster, it’s 2 months old so it’s a brand new hamster, very furry, very fuzzy, very cute, but the iOS iPhone airport Maps feature isn’t included on my hamster!!! WHAT AN OUTRAGE!!!! A ridiculous waste of space like little old me and Bills comments!!! Indoor maps are available for all iOS devices running iOS 11.3 or later. You said you tested on older devices and it doesn’t work, were those devices updated to at least iOS 11.3? Sorry that’s iOS 11 or later, not iOS 11.3 or later, my mistake. Tried this on an iPhone 5 SE running iOS 11.3. Viewed LAX on maps and there is no “Look Inside” text when zooming in. Perhaps the processor or display limitations do not support this feature. So I guess people are looking at the floor of airports… no one looks at signs? Spoiled brats! Get a life. The “Look Inside” map feature is now working on my iPhone 5s. That is right, an iPhone 5s. Since the iPhone SE is similar, I expect it should now work with iOS 11.4 as well.